In small bowl, beat oil, vinegar, preserves and salt with wire whisk or fork until blended. In large bowl, toss remaining ingredients. Pour dressing over spinach mixture, tossing gently to coat. This light and sweet salad partners nicely with baked fish, cooked carrots and crusty whole-grain rolls. 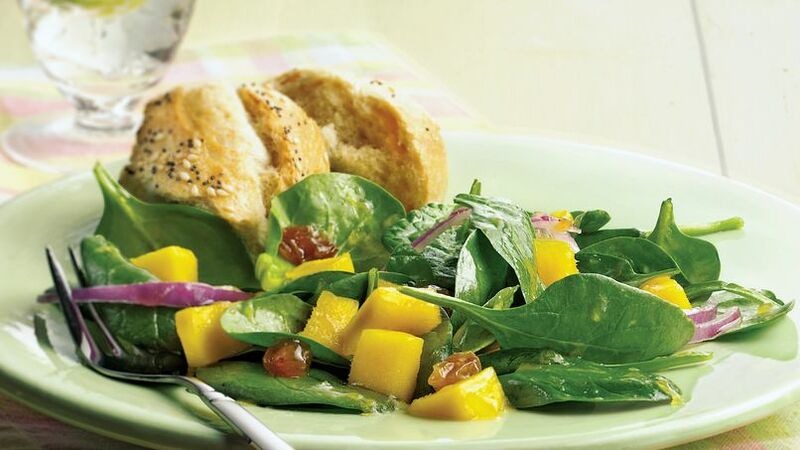 Spinach and mangoes make this recipe high in vitamins A and C. Try to get at least five or more 1/2 cup servings of fruits and veggies per day for optimal health.